How much does it cost? $9.95/month or $79/year (additional students are $20/year). Oh Look! CANADIAN math content online!! Yahoo! 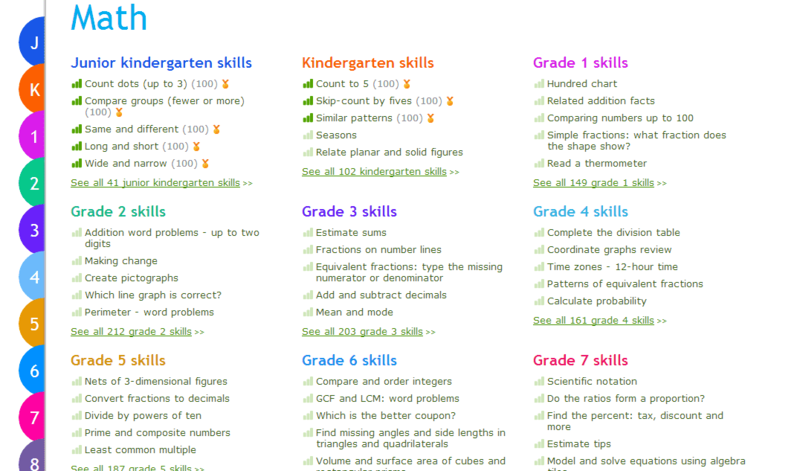 Designed for students in the Grade JK to Grade 11 crowd, this site is really perfect for just about anyone who wants to have a way to practice their math skills. To get started you simply register, add in the names and information about each child, let them pick a cute little icon for themselves and get going. You can pick what province you are in, so that all the work your child does follows along with that province’s government curriculum. The various exercises are divided up into sections based on the learning outcome and very easy to move along with. As they complete each set of questions, the kids earn badges and prize cards that they flip over on their game board for that grade. There are several “blank” squares that open up with a bonus prize as they keep at it. The goal of each section is for them to attain 100 on their “SmartScore” – which goes up at different variables throughout the session. For example, at first, each correct question is worth 10 points, but as they go along, each question loses value. After 90, the kid is sent to the “challenge zone”, which is really 1 point per question until they get to 100. Unfortunately, if they get a question wrong, they also lose points. The idea behind this is to ensure a child’s mastery of the skill before moving them on to another task. Good in theory, but potentially frustrating. Middle, in particular, finds it discouraging and can easily get to a point of being very flustered and unable to proceed successfully. When they get a question right, they get a word of encouragement. When they get it wrong, there is an explanation on what they did wrong so they can learn from it. Thankfully, though, if a session is abandoned in the middle, the program remembers how many points and questions they’d already completed and they can move forward from there. This has helped with tasks that started getting discouraging. I know some people on the crew were using IXL as a way to come alongside their current math curriculum – finding the appropriate sections to co-ordinate and further develop the skill they are working on already. However, I literally just logged the boys in and let them do whatever they wanted, for as long as they wanted. It’s now part of our daily school time – kind of like math gaming time. I found it interesting too to see how different my boys were. Little just hopped around the site, picking math questions and sections at random and loving every minute of it. Middle, however, started with the first question of JK and completed the whole level before moving to the next grade. 🙂 Big tried the program and decided that he didn’t want to do it. I honestly don’t see how the “prize” system would appeal to anyone over the age of maybe 9 or 10. Definitely not the Grade 11 crowd, but maybe just the challenge of completing the tasks would be enough to encourage them to continue. One feature I like is that I can keep tabs on what they’ve been doing, by checking the “reports” section on the website and also because I get regular emails telling me how my child has been doing. As a bonus, you can actually print out a certificate with each achievement which is a nice little boost to your child’s confidence! You can try up to 20 questions a day on the website as a trial if you would like to see more of what it’s like before deciding to purchase a membership. Want to know what my fellow crew mates thought of it be sure to click the picture below. we love IXL! i just signed up for it this year, and it’s the perfect compliment to our existing curriculum. i love getting those happy emails! I use this program for all of my math classes. I teach grades 9-12 and I have a wide range of math abilities in each class. I have read some comments on different sites that claim they do not like this program as it only allows for practice and not teaching. Also some have said they do not like the scoring as you loose more than you gain. My response to this is, I can tell it is not a site for high academic level students, it works great for my lower levels or struggling students, the scoring helps prevent students from randomly typing in answers and due to mainly focusing on practice makes the teacher teach the subjects to them first and not relying on the program to do it. I think that technology is great, however it cannot replace a teacher. IXL combines both of these, the teacher teaches, and the program is there to practice. Best that I have seen so far. Thanks for your feedback, Mr. Hartley. It’s great to hear how it’s working for teachers. I agree – it’s a terrific practice program! Hopefully they will move to a wider language range in the future! We’ve used IXL for a year before but I don’t see my child is making any progress. Instead, he seems to be losing interest on math. Then we changed to use Beestar, another similar after school learning website. To my surprise, my child loves to use Beestar much better. He said the questions are more fun. Now I am thinking to let him join its GT math program. I heard the math questions on Beestar are more challenging but my child seems to like challenges. btw, the price is even lower than IXL. IXL is useful, but I dont want my kid to spend too much time on computer screen as it is not good for eyes. Threfore I prefer printable practice workshets, this is where I found another alternative to IXL, i.e. http://www.edugain.com which additionally provides printable worksheets.